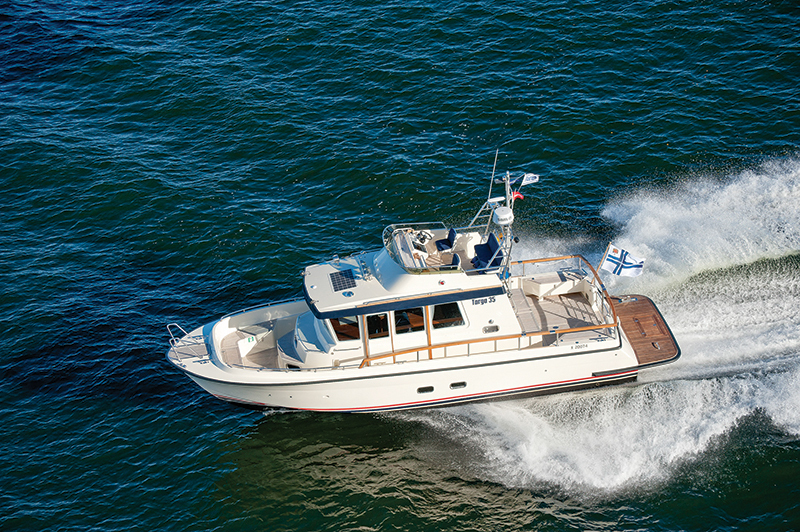 Built for the rigors of northern European waters and with an eye toward comfort and style, this Finnish vessel is sturdy and practical. Boats reflect their owner, but they also reveal something about their builder. How, where and for what purpose a boat is built help demonstrate why it is configured in a certain way. The Targa 35 is built in Finland in a small town that lies at nearly 63 degrees north latitude, just shy of the latitude of Fairbanks, Alaska. To get to the same latitude as the Targa factory outside of Malax, Finland, someone in Seattle would need to trek north a further 851 miles. For perspective, the distance from Los Angeles to Seattle is 813 nautical miles. While Targa has built commercial, military and fishing vessels, it specializes in high-end recreational boats. Will these boats built for a remote and rugged region of Northern Europe meet the needs of boaters here in America? Matt Hardin and Brian Anderson from Cardinal Yacht Sales were looking for a sturdy and practical boat line that had the fit and finish to satisfy not just fishermen but cruisers too, and just as importantly their spouse and family. Affiliated with Northwest Diesel Power and an authorized service center for brands such as Coastal Craft, Cardinal specializes in servicing boats. Whatever vessel the crew was going to sell had to be built to high quality standards and needed to be easily serviced, since they would be handling the work themselves. Hardin traveled to Helsinki and beyond to better understand the brand and was impressed enough when he returned last year that Cardinal decided to take on the Targa line. As we walked down the docks toward the boat, I thought of Finland and pictured rugged boats cruising vast fjords with mountains rising high above the icy waterways. The Targa 35 fits the bill. It has a solid, purposeful look with a forward-sloped windshield, deep gunwales and a large cockpit surrounded by teak-covered rails. Molded-in steps lead up to a flybridge with open-air seating aft and a helm station and companion seat protected by a Venturi windshield. A stainless radar arch is complemented by a flag mast that rises from the deck below to create a distinctive ship-like appearance. 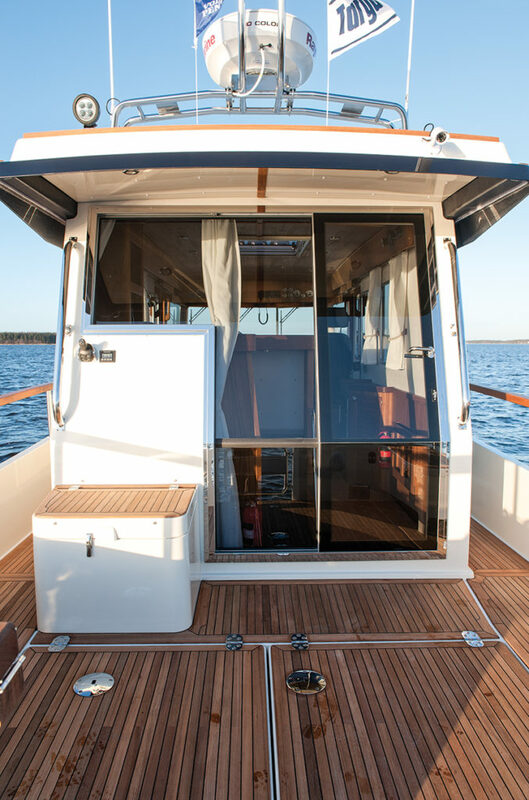 Teak decking starts in the cockpit and continues through deep, protected walk-around side-decks that lead forward to sliding doors on both sides for cabin access. Ahead of the cabin, seats with storage beneath them wrap completely around the inside of the bow to form a large congregating area. Unique to this type of boat, this area can easily seat eight people, all with backrests and in conversation range. This is a great gathering spot and can just as easily be used for fishing. Another Targa at the dock was rigged with four downriggers, two in the cockpit and two forward in the bow area. 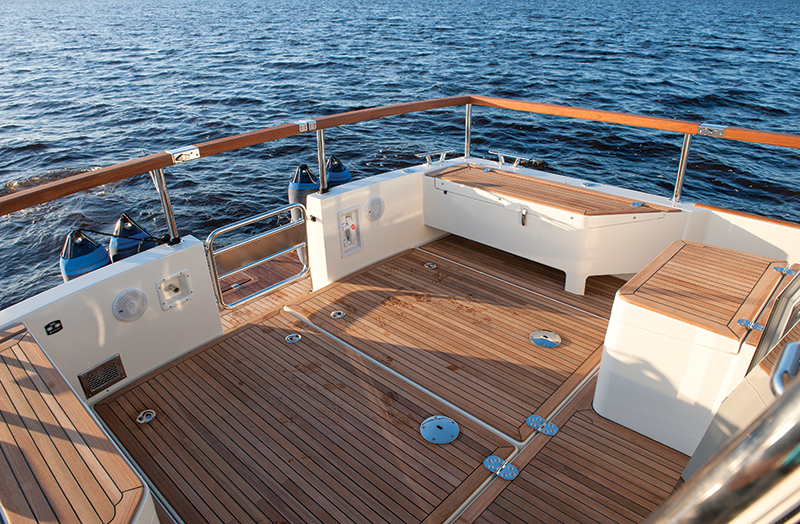 Inside the cabin fine-grained teak and top-quality joiner work are evident throughout. The dash has hinged compartments for storing navigation essentials such as binoculars and handheld VHFs. An additional storage bin for charts and larger items lowers from the ceiling. 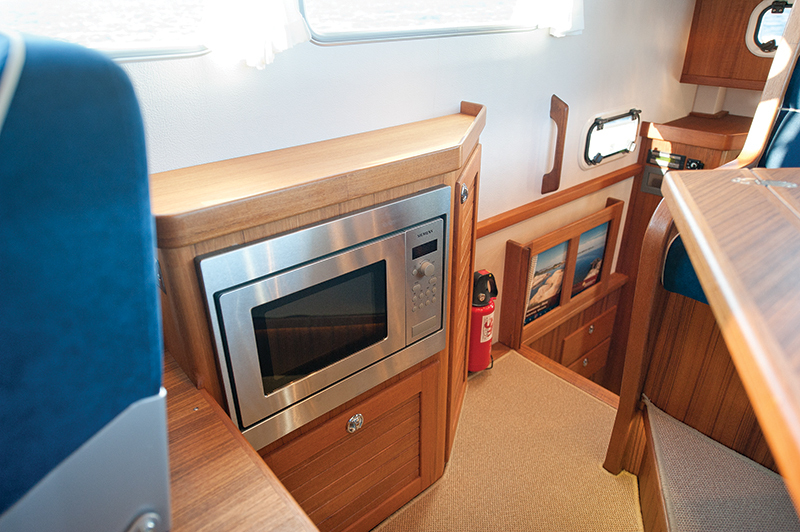 Each Targa is customized for the owner, and on this vessel the port side of the dash conceals a galley with a stainless steel sink and an electric stovetop. Below, drawers hold silverware, plates, mugs, glasses and even a row of six shot glasses, all of which fit neatly in custom compartments. The refrigerator is under the helm seat and a convection/ microwave oven is in the adjacent salon. This doesn’t seem like an ideal galley layout to me, but the arrangement can be changed to suit an owner’s needs. 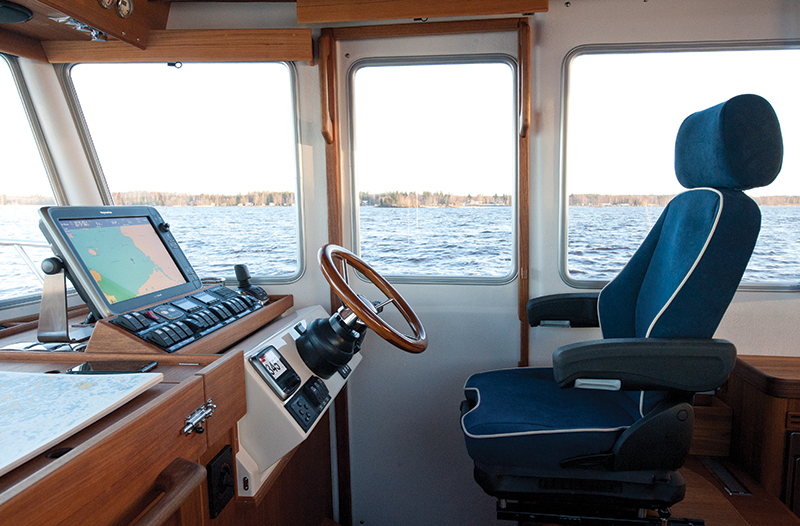 Inside, steering is to starboard, and within easy reach behind the helm seat is a counter along the window that has flip-up plugs and USB ports for charging. A hatch in the middle of the dash leads to a belowdecks forward cabin that includes a V-berth with a filler cushion and a head (optional). The salon consists of a comfortable settee with a leafed table. Relaxing and dining are the main activities here, and occupants have good visibility. Behind the seating, a few steps lead down to the master cabin, which has a head with a foldout shower enclosure. Before departing we head to the cockpit for a quick look at the engine room. 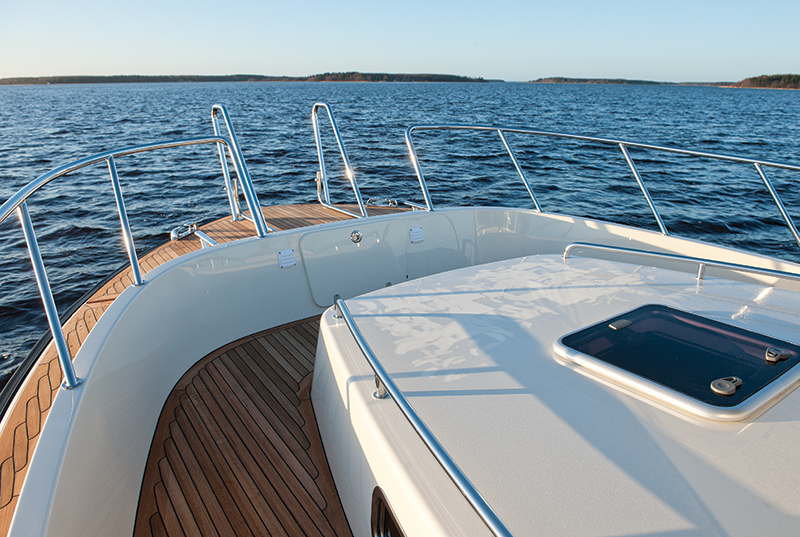 Large hatches provide easy access to the twin Volvo Penta D6 330s that push sterndrives. On the bottom of the hatches, canvas pouches hold deck chairs and a teak table that can be set up in the cockpit or the forward seating area. There is ample space to get to both sides of the Volvos, and systems such as water pumps and fuel separators are mounted precisely along the bulkhead. Battery switches are lined up and labeled, and meticulous wiring leads to them and the charger. A spare bronze duoprop is mounted neatly in one corner. A stainless steel bin holds a container connected to a manual sump pump that clears the engine bilges to prevent any possibility of pollution. Details like these demonstrate why a dealer focused on service chose this manufacturer. The engine room shows the care and quality that go into building these boats. The hull is solid fiberglass and is supported further by a grid-bonded foamfilled glass stringer system. Conditions in the far northern reaches of Europe can be severe, and these boats are built to handle extreme weather. Out on Bellingham Bay on an overcast 55-degree day, the seas were calm. During reciprocal runs, to account for any tide or current, the Targa 35 averaged 37 knots at wide-open throttle with very little tabs. Range at that speed is 309 miles. Between 21 and 29 knots, the 35’s performance remained constant, with a fuel burn of 1.24 mpg. A fast cruise of 26 knots, 2850 rpm, burned 21 gph and yielded a range of 368 miles. Below 2000 rpm, the turbos hadn’t fully kicked in and the boat cruised at displacement speeds. It powered out of the hole easily and leveled off as it accelerated. With no real waves available, we decided to do figure-8s to catch our own wake. I can’t say this method is a particularly effective test of sea kindliness but it sure is fun. At 30 knots we made concise circles in both directions with no perceptible cavitation. We performed tight turns of three to five boat lengths while the 35 leaned cleanly into the turns and bounced over its own wake like it was nothing. The helm is well laid out with instruments and a chartplotter on both the dash and an overhead panel. This Targa 35 is equipped with a joystick and I wanted to try it, so as a light rain fell we headed back. I have used IPS joysticks that look the same as this one but had not tried one on a sterndrive application. Anderson explained that the bow thruster is not connected to the joystick as I eased past a Targa 30 to dock in front of it. Kicking the throttles back to neutral, I played with the joystick a bit before pushing the handle sideways. The stern began to creep in immediately and a few taps of the thruster eased the bow dockward, and the boat moved slowly sideways to the dock. I felt like I had cheated but it was comforting to know that anyone can dock this boat even if he lacks boat handling experience.